Of course, the image is extremely simplified. It’s not uncommon to see teams dedicated to creating monitoring checks for the other teams, for example. It’s pointless to concentrate on optimizing any part of your organization, as a whole, if there is no progress at the place where the bottlenecks happen. In our example, if we eliminate all the requirements changes (for example, through adoption of short sprints and proper feedback loops with all the stake holders), we will see a direct improvement. 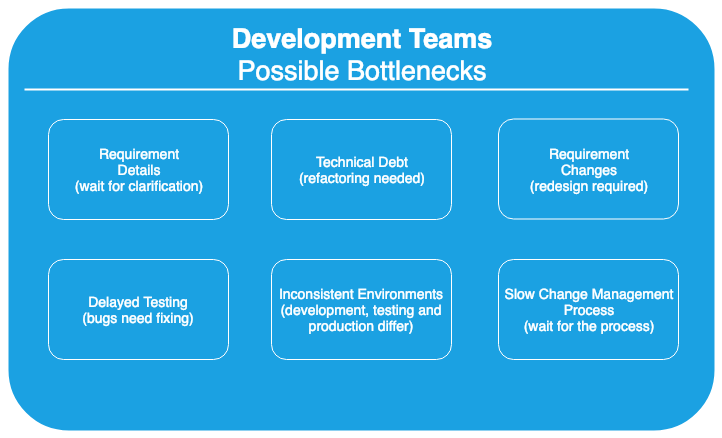 But if the team works on improving the documentation (that is currently not a bottleneck), the development process will no experience any change. Normally, processes either are generated by policies or by practices. This is where Conway’s Law comes in full effect. When a person interprets a policy, naturally the process will be designed as close as possible to the existing communication paths. The same, if a practice gets documented in a process. It will follow the way the majority already works. In a newer or smaller company, it’s relatively easy to change a process to eliminate a bottleneck. Everything gets slower in bigger or older companies, where you also have old policies in place. Sometimes, the only solution is to make sure that the process owners actually know the policy or to question the way a policy is formulated. A surprisingly big number of people give answers like “We have this process because of our dual control policy” (note: sometimes this is known as “four-eyes-principle” or “double check principle”) or “We cannot give access to the developers because of our segregation of duty policy”. Both answers were, in that particular case, wrong. They were used as an excuse to highlight why it’s impossible to change, to improve. The moment the actual policy was consulted, there were a lot of ways to eliminate the long approvals and and difficult handovers. However, as someone pointed out, there might be legitimate cases where regulations explicitly require this type of policy. The point I’m trying to make here is to always make sure that you go for the origin of the bottleneck. In a highly regulated environment (think: banking), most (not all) policies have a regulatory requirement behind them. Understand the requirement and you can see how you can improve the policy. Improve the policy and you can improve the process. 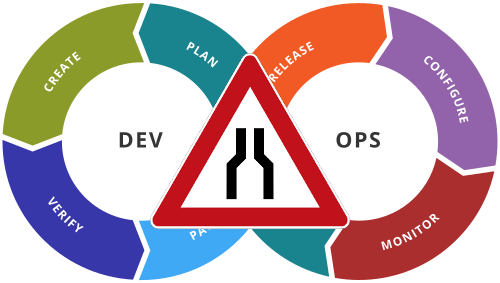 Let’s not forget that most policies predate concepts like Continuous Integration, not to mention Continuous Delivery or Continuous Deployment. Of course, it made sense to put in the policy phrases like “The change request must be approved seven working days before the planned change.” (this is actually an optimistic example - I’ve seen a case with 21 working days). If most of the roll-out steps are manual, you need a lot of time to prepare it. If you have one release per year (and sometimes every two years), there will be a long list of one time actions needed during the deployment. The same applies to the number of approvals needed for a change. Also in the banking sector, I’ve seen a policy requesting approval from all stakeholders for every change. In that particular case, the translation into the process was 36 approvals. And not from teams, but from 36 individuals. In between, get more approvals (I’m happy I don’t remember all the details there). Compare this to a Pull/Merge request, with an automated build / test and deployment pipeline. The strict requirement of having someone else approve the change and trigger the rest of the process is easily met by having someone else review the request. Communication gets a special place here, even though it’s normally documented in a process or policy. The same as we have a lot of tasks and we handle them based on some priority, other teams also have tasks and duties. It’s always good to follow up on any opened ticket or even sent e-mail. A phone call or even a personal discussion (when possible) goes a long way. Don’t assume that, just because you’ve assigned a work package, it will be handled with top priority. In the next article, I’ll be talking about organizational structure and the relation to the culture.